Primely located in central Lisbon, InterContinental Lisbon is a luxury 5-star hotel overlooking the famous Eduardo VII Park. It is just 500 metres from Marquês de Pombal Square and 700 metres from trendy Avenida da Liberdade's boutiques. InterContinental Lisbon has chic, spacious guestrooms. Many of the rooms have panoramic views overlooking the park's green areas. 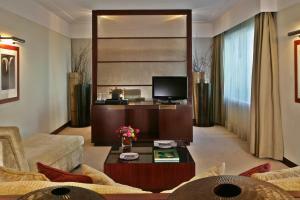 All rooms have flat-screen TVs and access to satellite channels. Free WiFi is available throughout the hotel. The hotel’s Akla Restaurant is open daily and serves a wide range of international dishes alongside a wide selection of Portuguese specialties. The UpTown Bar is the perfect spot to enjoy a drink in a relaxing, homely environment. Local restaurants are available within a short walking distance, many serving typical Portuguese dishes. The nearby Marques de Pombal Metro Station connects with most of the city's emblematic areas. Lively Bairro Alto is 3 km away and features a variety of popular bars, restaurants and cafés. Rossio and Chiado, two of the historical downtown's most famous areas are both at a short 5-minute drive. The emblematic São Jorge Castle is 4 km from the hotel. Portela International Airport is 7.4 km from the InterContinental Lisbon. Please note that from the 1st of January 2016 a city tax of € 1 per person, per night is not included in the total price and should be paid on site. This tax is charged to guests aged 13 and older. It is subject to a maximum amount of € 7 per guest. Rate: € 135.30 ... € 698.00; select dates below to get current rates. This twin/double room has a bathrobe, air conditioning and minibar. This twin/double room features a minibar, air conditioning and bathrobe.